Classic See 'n Say play - turn the arrow and pull the lever! 2 Ways to Play Animal Identification and Quiz modes. I have to agree with the other review – what’s with the bunny going “boing boing”? That’s ridiculous. And my son also had trouble pulling the handle for a while. I admit though, my son likes this toy and it is kinda nice to have two different sides so there are more animals. However, I really wish there was a way to turn off the quiz function. Or if the quiz section was only on one side. This toy appeals to a lot of children who are too young to get the quiz thing, and it’s a little disruptive when they get into the groove of learning about animal sounds (even the made-up ones) and all of a sudden the thing is asking them questions. And you either have to fix it by pointing the arrow to the correct animal yourself, or wait until it turns itself off. I mean, I’m sure it’s a nice feature for kids who are big enough to understand how to do it, but I just really would rather not deal with it sometimes. As many reviews as I write, I wish I would’ve read the others listed on here. This toy is NOT the toy you remember from the 80’s. It’s cheap, small, flimsy and the paint is sloppy. The handle is too hard for toddlers to pull all the way down in one fluid motion, and unless you do just that, no sound comes out. In other words, unless you pull the handle down quickly and completely, the spinner moves without making any noise – kind of difficult when you have the motor skills of a 20 month old. What I was looking for was the old toy I had growing up, where you’d pull the handle and the spinner would land on an animal and give that noise – “The cow says ‘Moo! '” for instance. 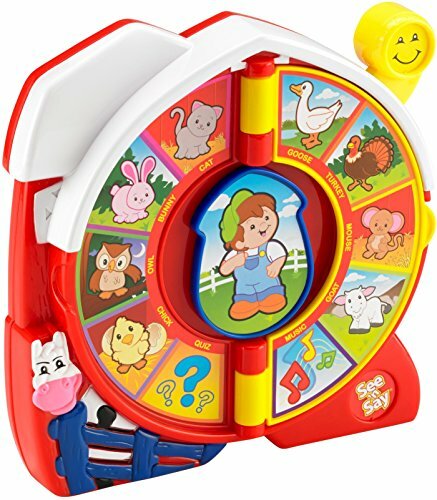 This toy has goofy sentence structure and for some reason they felt if necessary to incorporate the “quiz” square where the voice repeatedly asks you to find an animal until you physically turn the spinner to that animal and pull the handle. Again, too confusing for a toddler who just wants to hear animal sounds associated with pictures of animals. I wouldn’t buy this toy for any of my younger children and am so disappointed. On top of being plain dumb, it’s cheaply and poorly made. Don’t waste your money – as for me, I’m going look for a well-preserved original at a yard sale or bidding site. My daughter received this for her first birthday and just loves it. She is not one to just sit in a lap but when my husband gets home from work, she goes and picks it up and brings it to him so they can sit in the chair and play farmer says. She loves to point at the animals and thinks the music is great. No problems pulling the lever (also great fun). The toy has been dropped many a time and my daughter also thinks it is great fun to stand on it, No problems to speak of.